The house is partly surrounded by a medieval wall and tower and a beautiful garden with a creek. All around are the meadows, the forests and the mountains. Peace and quiet, the experience of pure nature, forests full of mushrooms, raspberries and wild strawberries are the chief assets of our farm. Each guest will find something for themselves. Some may prefer lazy relaxation on the farm, others may be happy to trek in the mountains. 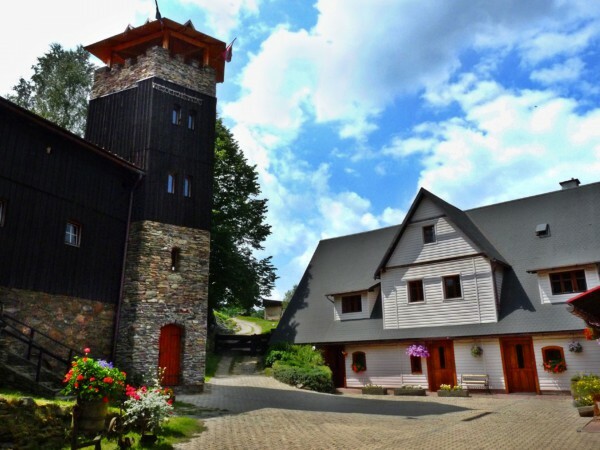 Our farm is also a perfect base for those who want to explore the region of Kłodzko. You will be enthralled with the place for sure! On offer are four double rooms, two triple rooms and one quadruple room. Our three holiday appartments include two bedrooms, a living room with a kitchenette and a bathroom. One flat is located in the tower. There is a swimming pool, trampoline and a tennis court. You can make trips on the horses. One of the advantages of this place is the proximity to Lądek Zdrój, one of the oldest health resorts where you can explore the culture, enjoy a bath in the thermal waters and try some natural healing treatments. There are also some interesting rock-climbing areas in Lądek Zdrój. This is truly a fantastic spot for spelunkers with Jaskinia Niedźwiedzia (Bear Cave) in Kletno (20 km). There are skiing opportunities nearby with two ski lifts in Nowy Gierałtów and Bielice; these are illuminated in the evening. But for the demanding skiers there is the ski complex “Czarna Góra” (15 km). It’s always worthwhile to visit the city of Kłodzko and its Historic monuments, including the fortress and the underground tourist trail. History buffs can also go to the historic gold mine in Złoty Stok. And for nature lovers there is the Stołowe Mountains National Park.